Natural gas: Reliable or clean energy? The United Nations projects the world population to reach 9.7 billion people by the year 2050; the rate of urbanization of the past decade was unprecedented. Mankind’s insatiable demand for energy cannot be overlooked. From 1973 to 2016, the proportion of the world’s energy generated using natural gas increased from 12.1% to 23.2%. Natural gas has always been a huge part of energy generation throughout the years, and there are many diverging opinions of its use. This article will discuss the pros and cons of using natural gas as a means of producing electrical power from an ethical standpoint. Many countries have recently announced a policy shift to increase the use of natural gas for power generation because it is the cleanest fossil fuel. Natural gas is considered environmentally friendly as it emits the lowest greenhouse gases, such as CO2 and NOx, per kWh of energy produced. In addition, combusting natural gas doesn’t produce ash or particulates that can cause health problems. Natural gas is one of the cheapest fossil fuel and highly efficient when used in a combined cycle gas turbine. The introduction of liquefied natural gas resulted in improved storage, enabling it to be economically transported to almost anywhere on the globe. If natural gas is omitted from the world energy mix, no other power generation source could fill that energy void. Coal-fired power has been notorious for its high CO2 emissions, which contribute heavily to global warming and climate change. Some European countries plan to phase out coal-fired power completely, including France by 2023, the UK by 2025 and Finland by 2030. If we were to completely rely on nuclear power, we have to build approximately one nuclear power station per day for the next 30 years in order to accommodate the growing energy demand. Furthermore, the sole use of nuclear energy would result in significant amount of radioactive waste products that have detrimental effects to the environment. Despite renewables being carbon free, they are not efficient enough and too costly to supply the world energy demand. The increase in the usage of biomass for power generation would likely lead to higher food prices, which in turn may result in higher famine rates in the developing world. In order to ensure a reliable and uninterrupted electrical supply, natural gas has to be included in the world energy mix. Therefore, from a utilitarian perspective, the use of natural gas for power generation brings the greatest happiness for the greatest number of people, and thus it is ethical. Natural gas fired power plants can be integrated with Carbon Capture and Storage (CCS) to reduce CO2 emissions. However, this has not attained high levels of commercial attention due to the high energy penalty from the carbon capture unit. With the recent emergence of technologies such as Exhaust Gas Recirculation (EGR) and Selective-EGR (S-EGR), natural gas fired power plant with CCS could be more feasible. In 2017, a scientific breakthrough of converting CO2 captured from air into fuel was realized. This technology is powered by renewables and patented as AIR TO FUELS™. When sufficient advancement in renewable energy technologies is achieved, air pollution caused by natural gas power stations could be made reversible through this technology. Even though natural gas is regarded as environmentally friendly, it is a fossil fuel that produces CO2 during combustion, which is the root cause of global warming. Rise in sea levels and global average temperature for the past decade were detrimental. The time it would take the planet to recover from the CO2 emissions already put into the atmosphere is estimated at a minimum of hundreds of years, and continuing to burn fossil fuels such as natural gas will only make this worse. Although there are ways to reduce the CO2 released into the atmosphere, such as carbon capture, it would be more effective to invest the money that such schemes would cost into renewables, such as wind or solar, to ensure clean energy for the future. Transportation of natural gas through land and sea requires expensive pipelines and specialised tanks. Installation of pipes underground is responsible for deforestation due to the long distances that it is required to cover. This is an issue as it creates environmental problems, such as destroying the natural habitat of certain species, causing soil erosion and affecting the water cycle. Natural gas is also highly combustible. The gas is odourless, colourless and tasteless, which makes it difficult to detect. This means that, should a leak occur, it can be very difficult to locate. A study, based on a methane pipeline explosion in Aliso Canyon, California, in 2010 found that the total amount of methane leaked in a four-month period was equivalent to the annual greenhouse gas emissions of 600,000 cars. This would have a major contribution towards global warming because methane is a stronger greenhouse gas than CO2. As professional engineers, we should abide the stand still principle. This states that we must not pass on a poorer environment to the next generation than the one we received from the previous generation. The burning of natural gas is clearly wrong because the CO2 released into the atmosphere will have serious environmental consequences, affecting future generations. This is much greater than the impact that abandoning natural gas will have, making burning them an unethical action. A Kantianist would argue that the maxim “natural gas should be burned to produce power” being made universal would clearly be unsustainable. The amount of natural gas left in the world at current consumption levels is estimated at 100 years’ worth. If natural gas became the main source of power, this estimate would drop considerably, resulting in an unjust distribution of resources between different generations. This, in addition to the greenhouse gases emitted, would clearly have an adverse effect on the environment, and thus, according to Kantianism, the burning of natural gas is unethical. We should continue to use natural gas for power generation. I believe the cons use of natural gas in power generation has outweighs the pros. From the environmental and economical stand point, it is true that natural gas provides cheap and clean energy and does not harm the environment as much as coal or other energy generation mean. This is very important as the greenhouse effect is taking its toll on our Earth and generating energy by using natural gas can help slowing down this phenomenon. However, natural gas alike coal, fossil fuel and nuclear fuel is a finite energy source. True, burning natural gas is cheap and helps saves the environment for now, but it would be a real problem in the distant future when natural gas runs out. Based on the figure shown above, the usage of natural gas on energy generation has doubled in the past 50 years. This would be worrying if the situation is unchanged as stated above in an argument that the natural gas resource has nearly 100 years left! In conclusion, I think we should not rely too much on natural gas and move toward renewable energy as it is the cleanest and most natural energy source available on Earth! A good point. The main issue I see with it is that we need electrical power. As a society, we are dependant on it, for better or for worse. The ideal situation would be for people to use significantly less power and for us to be completely reliant on renewables, but as this is not the case (and it does not look like it’s going to be the case for a long time), we need power from somewhere that isn’t renewables. Gas and nuclear are the two sources of energy referred to as “bridge fuels”, in that they are the cleanest to use on a large scale until we have enough renewables – thus the conclusion drawn. Nice article but with one large omission. The global warming potential for methane is 86x higher than that of CO2 over a 20 year time period and bodies like the IPCC are saying we could breach irreversible greenhouse gas thresholds by the mid 30s. Methane leakage occurs all along the process from well to wheels. We’re currently very poor at estimating the amount but most papers range between 1.5 and around 6% being released into the atmosphere, above 4% and its better for the environment to use coal. Interesting, I wasn’t aware of this. I would be interested in a source for some of those numbers. The GWP of CO2 isn’t the only important thing to consider when comparing coal and methane. Coal also emits a lot of NOx, which at a glance has a GWP of 270 (Wikipedia), and is, along with other gases and particulates emitted by coal combustion, terrible for health. Mining coal also releases methane into the atmosphere (https://en.wikipedia.org/wiki/Coal_mining). In addition, when using fossil fuels alongside renewables, they need to be able to change demand quickly to cope with change in wind or solar production. Gas turbines can do this much more efficiently compared to coal, as coal takes hours, if not days, to fully ‘turn on’ from cold. From the pie chart, we cannot even get rid of the 9600 TWh of electricity generated by coal. How are we going to omit the 5800 TWh of electricity generated by natural gas? Imagine for a moment the consequences that will arise if we shut down all natural gas CCGT right now. The top three CO2 emitting countries are China, United States and India, and they all share one thing in common: they all have a huge percentage of coal in their energy mix. From World Energy Outlook 2017, there are 2 million premature deaths due to air pollution in China. It is clear that the use of coal for power generation is the major culprit of global warming. Therefore, in order to combat global warming and climate change, we have to get rid of coal fired power. It is true that if all countries were to include a high percentage of natural gas in the energy mix, natural gas will be depleted within a century. However, we should not underestimate mankind’s rate of technological advancement. China’s fusion test reactor had achieved temperatures six times hotter than the sun in 2018 and SpaceX will be sending people to Mars in 2025. Natural gas fired power plant might be obsolete in the distant future, but I think that this will not be the case for the next few decades. We should not jump the gun and exclude natural gas together with coal at the present time. So for the time being, I believe that we should continue to use natural gas for power generation to stall the worsening effect of global warming until advancement in renewable technologies is achieved. I believe that we are not ready to completely halt the usage of natural gas yet. As suggested in the title, natural gas is in fact reliable, seeing how it is considered as environmental friendly. One possible way to counter the leakage of natural gas is to implement AI systems along the few mile long pipes. With constant monitoring, repair works would be carried out when notified, significantly reducing leakage. As such, greenhouse gas such as methane would be significantly reduced, resulting in a less detrimental effect towards global warming. To conclude , I believe that a renewable energy source that outweighs natural gas in every aspect should be put into use. However, such a source has not been discovered hence leading to the usage of natural gas as the benefits of it’s usage outweighs other energy sources at the moment. The use of energy especially electricity in the modern world which we are currently living in is very essential as most people on Earth are too dependent on it. The Industrial Revolution kicked start the high carbon emission that kills the planet, but also provide the energy and electricity required to accommodate humans. To produce large amount of clean sustainable energy as an alternative solution to fossil fuels is very achievable, but would probably take a long time to achieve this solution. In conclusion, the energy mostly generated from fossil fuel that we use is what is killing planet Earth. Would you sacrifice to live without technologies and fossil fuel energies knowing you would save Earth or consume the energies and integrate technologies anyways and live comfortably. I don’t think that it is possible to omit the usage of natural gas completely as an energy source. However, there are a few good reasons to gradually switch focus from natural gas to other energy sources. With increasing population and energy demand we should not rely heavily on a finite energy source. Besides, natural gas is only considered more environmental friendly if compared to other fossil fuels. 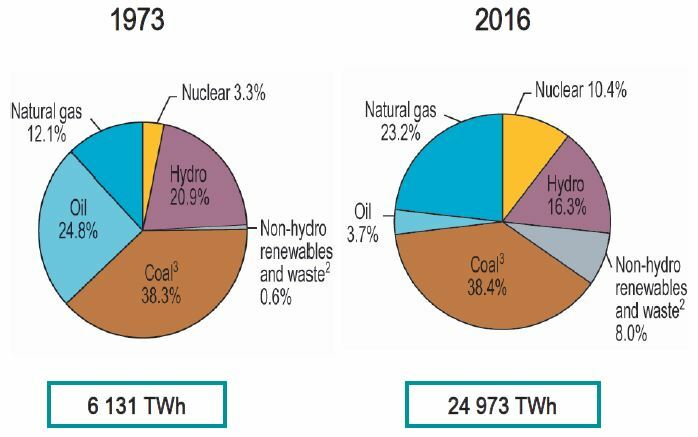 Carbon emissions were still far greater compared to a lot of low carbon energy source such as nuclear, biomass, hydro, wind. It would not be easy to implement CCS especially for existing plants and factories. From economical and sustainability stand point, it may be more beneficial to focus on developing and implementing renewable clean energy source, rather than mitigating the emission release. Also, I have to disagree with your statement where usage of biomass would increase food price, as that only applies to first generation biofuels.